Go North on US 75 until you reach 635 West. Take 635 West and exit the Dallas North Tollway going North. Continue on the Tollway and exit Main St./Cotton Gin Rd. Toyota Stadium will be on your right. Or... Go North on US 75 to 121 S. Take 121 S to the Dallas North Tollway. Proceed North on the Tollway and exit Main St./Cotton Gin Rd. Toyota Stadium will be on your right. Travel West on 635 until you reach the Dallas North Tollway. Take the Tollway North and exit Main St./Cotton Gin Rd. Toyota Stadium will be on your right. Travel East on 635 until you reach the Dallas North Tollway. Take the Tollway North and exit Main St./Cotton Gin Rd. Toyota Stadium will be on your right. Travel South (from US 35E or US 75) to HWY 380. From US 35, take HWY 380 East to the Dallas North Tollway. From US 75, take HWY 380 West to the Dallas North Tollway. Proceed South on the Tollway and exit Main St./Cotton Gin Rd. Toyota Stadium will be on your left. Toyota Stadium has limited parking spaces, so the purchase of extra spots is prohibited. Parking opens on both event days, Saturday, May 4th at 9:00am CST and Sunday, May 5th at 9:00am CST, until lots are sold out. You may only purchase a MINIMUM of 4 spaces. Any additional spaces must be purchased in increments of 2. To reserve Overnight RV parking space(s) a form has been created to process orders more efficiently. For the Overnight RV parking order form CLICK HERE. 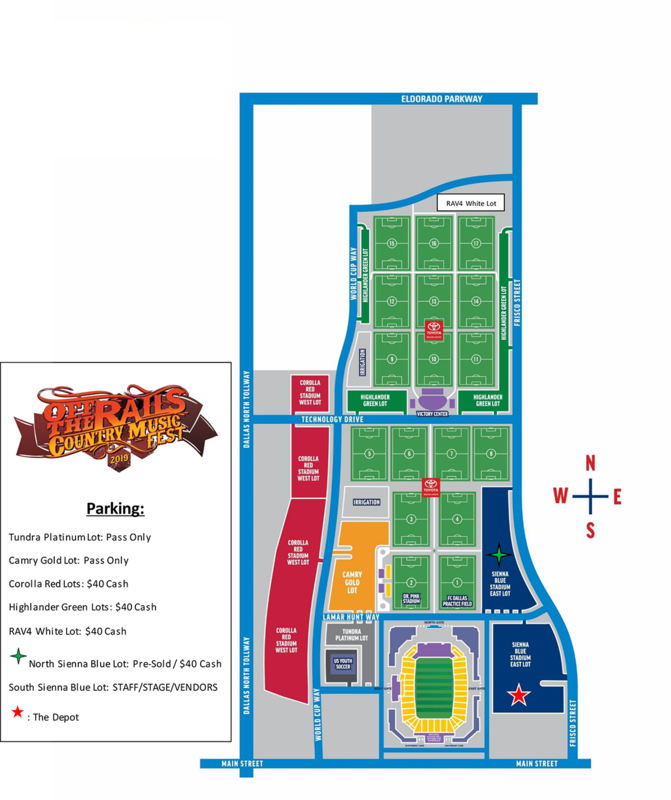 For any other questions please email concertparking@fcdallas.com and a representative will follow up with you. There are no RV hook ups, electrical, or plumbing available at Toyota Stadium. For safety reasons, once inside the parking area, vehicles cannot be moved from their spaces for the duration of the weekend. NO IN OR OUTS. All single parking spots for cars will be $40 on day of show. ONE SPOT FOR CARS. CARS CANNOT PURCHASE EXTRA SPOTS. TAILGATING MUST BE DONE IN THE FRONT OF YOUR CAR OR BEHIND IT. There will be single space ADA Parking available in all colored lots. Vehicles must display a state issued ADA placard. THERE ARE LIMITED SPACES AVAILABLE IN EACH LOT and are First Come First Serve. There will be no ADA parking available for RV/Campers. Visit www.friscotexas.gov and/or www.visitfrisco.com for more information regarding the City of Frisco, Texas. A no re-entry policy (no in and outs) will be enforced. Once you leave a lot you will have to repurchase another parking pass.